Instructions: Prepare a white card base at 4 1/2 x 8 1/2". Trim a piece of the Cherry Blossom Retreat paper 1/4 inch smaller and adhere to card. Cut 2 of the Elegant Pocket Accents out of white cardstock and adhere to card. Cut 2 of the Diamond Basics die out then cut 2 more making an open triangle, add foam strips and place on the first 2, adhere to the card one at the top and the other at the bottom. Stamp with Library Green and color with the Leaf Green on white cardstock 2 of the Cherry Blossom Retreat Vines. 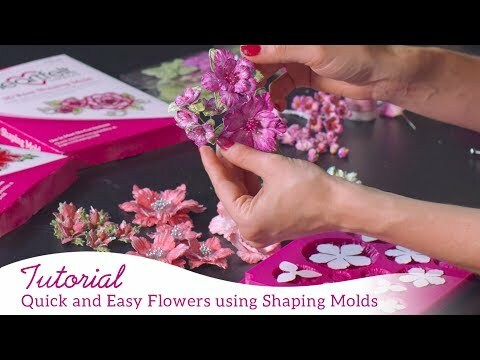 Cut out with the coordinating die, shape using the Flower shaping kit and adhere one on each side. Cut out 2 of the corner pieces from the Elegant Pocket Accent set and adhere one in the upper corner and one in the lower corner. Stamp all the flowers on white cardstock with the Manganese Blue ink, color with the French Ultramarine, cut out with the coordinating die, place in the flower mold. Stamp the leaves on white with the Library Green, color with the Leaf Green, cut out with the matching die, place in the flower mold and run through the machine, adhere all the leaves and flowers on the card as shown. Locate the birds that are preprinted and colored from the paper pack, cut out with the coordinating die and adhere to card. Cut the tag out form the paper pack with the matching die and place a foam dot to the back, adhere to the card. To finish,add glitter to all the leaves and flowers. Add Prills to the center of each flower.